Prepare for a week of chaotic holiday travel this Thanksgiving. According to a report from AAA, this Thanksgiving, airports, train stations and roads will be the most crowded they’ve been since 2005 — with some 54 million Americans expected to travel more 50 miles. This is almost a 5 percent increase from last year, which comes out to about 2.5 million more people hitting the road. Cars are the most popular method of travel for Thanksgiving, with 48.5 million people driving, a 5 percent increase from last year. That’s followed by 4.27 million people taking planes (the largest growth, up 5.4 percent), then trains, buses and cruise ships, which account for 1.48 million travelers, up by 1.4 percent. Similarly, Airlines 4 America, an industry organization, estimates a substantial growth in air travel, but their stats are much higher: from 29 million last year to 30.6 million this year, Travel + Leisure reports. This works out to about 2.55 million people flying every day between Friday, Nov. 16 through Tuesday, Nov. 27 — at least 137,000 more people at the airports daily than in 2017. In the U.S., the busiest day to fly hands down will be the Sunday after Thanksgiving, Nov. 25, while Wednesday, Nov. 21 and Friday, Nov. 16 will likely also be jam packed. The senior vice president of AAA, Bill Sutherland, speculates the increase is due to “higher wages, more disposable income and rising levels of household wealth” this year than in previous years. Meanwhile, A4A says it’s because flights are cheaper than ever after adjusting for inflation. To minimize potential headaches, AAA createed a list of the worst days and times to leave 10 primary metropolitan areas in the country — as well as which highways to avoid and how long you may be delayed, so you know how much extra time to give yourself. For example, leaving Houston on Monday, Nov. 19, between 2 and 4 p.m. and taking the I69 could take you almost three times longer than usual. 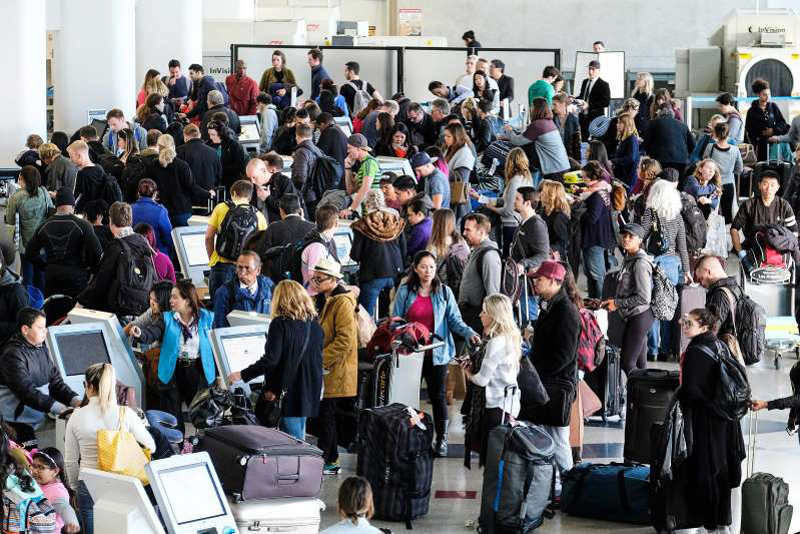 T+L recommends traveling on Thanksgiving day if you can swing it, when only 1.73 million passengers will fly (the lowest of the week) or signing up for TSA pre-check so you can skip security lines.